"I wanted a soup recipe that I could make with staples that I always have on hand. This has become a family favorite so I always make enough to freeze. Serve topped with grated Parmesan cheese." Heat olive oil in a large pot over medium-low heat. Cook and stir garlic in hot oil until fragrant, 2 to 3 minutes. Add onion; cook and stir until slightly softened, 4 to 5 minutes. Stir in carrots until heated through, 1 to 2 minutes. Pour chicken broth and diced tomatoes into onion mixture; bring to a boil, stirring frequently. Add red wine, reduce heat to low, and stir green beans, pinto beans, spinach, basil, oregano, salt, and black pepper into broth mixture. Bring to a simmer, reduce heat to medium-low, and simmer until vegetables are tender, about 40 minutes. Bring a large pot of lightly salted water to a boil. Cook seashell pasta in the boiling water, stirring occasionally until cooked through but firm to the bite, about 8 minutes. Drain and stir pasta into soup. Ladle soup into bowls and top with Parmesan cheese. You can substitute Great Northern beans, black beans, or kidney beans for the pinto beans, if desired. You can substitute 1 teaspoon dried oregano for the fresh oregano, if desired. You can substitute 2 teaspoons dried basil for the fresh basil, if desired. This was wonderful! We loved it and I will definitely be making it again! 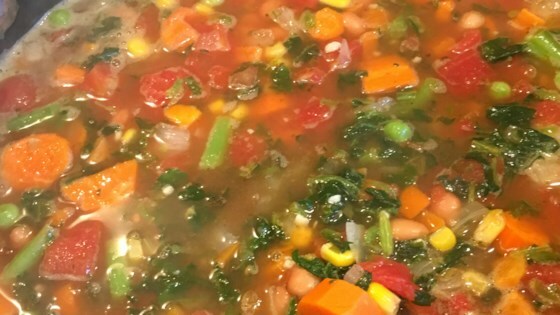 This will be my go to recipe for minestrone now. This has become a fall family favorite! My family loved this. I will definitely make this again.